Six anglers crowd around a pool not much larger than a pickup truck. They toss their lines into the shallow flowing water, hoping for a quick bite from a hungry creek chub or sunfish. They range in age from 10 to 55 but are all waiting for the same rush: the pull of a fish at the end of a line. This scene could take place at any lakeside ranger-led fishing program, but today’s group is not fishing waters measured in acres. It’s casting along Sawmill Creek. At 10 feet across, Sawmill Creek at Waterfall Glen is one of the county’s smaller off-the-beaten-path waterways — with smaller fish — but Salt Creek and the east and west branches of the DuPage River all offer a shot at small- and largemouth bass, walleye, northern pike and the occasional muskie. When you’re fishing a river, current is key in deciding where and how to present your bait. Most fish hold in areas adjacent to the current and not directly in it. If they stayed in the main current they’d use more energy, which means they’d need more food. (Think of it like swimming continuously on a flowing treadmill.) It’s much more efficient to hang out in slower waters, darting into the faster only for passing food. 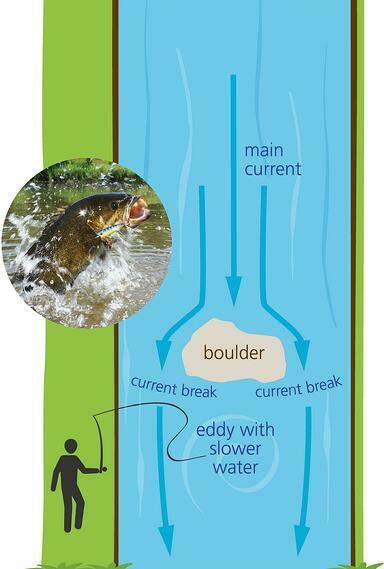 The line where the main current meets slower water created by boulders or other objects is a “current break” and a good place to cast for smallmouth bass and other fish. To find these slower waters, look for features such as boulders, bridge pilings and points of land, which create calmer, swirling pockets called “eddies.” The imaginary line where the main current passes the boulder or piling and meets the eddy is called the “current break” and is where you want to cast. Fish hold tight to current breaks, especially when the main current is strong. Another prime casting location is downstream of any barrier that prevents fish from moving upstream, such as riffles (submerged rocks in shallow areas that create fast, choppy water) or a dam. Once you cast, you need to watch what your bait is doing and adjust accordingly. If you’re bottom fishing and casting across the current to reach a current break but your bait gets swept downstream, you’ll either need to add weight to keep your line where you want it or change your location. If you’re fishing with artificial lures, you’ll notice they act differently upriver than down, depending on how they’re designed. In still waters these differences don’t exist. In DuPage forest preserves, fishing rivers from shore is the most common approach. Fullersburg Woods, Hidden Lake, Warrenville Grove and others have easy open access with short walks from the parking lots. From shore, find an opening where you can cast freely into one of the prime locations noted earlier. Take time to fish the spot thoroughly from different angles. If the fish aren’t biting, go to a different spot. You’re more likely to be successful covering one area and then moving to another than waiting for the action to come to you. If you have a kayak or canoe, floating as you fish lets you cover larger areas more efficiently. Warrenville Grove, McDowell Grove, Salt Creek Park and Blackwell are just a handful of preserves with easy access to the county’s main waterways. To boat on a river you need to comply with all Illinois boating regulations, but you don’t need a Forest Preserve District private boating permit. On the water, controlling your boat is critical to proper bait presentation. Because the current will carry you downriver most of the time, the easiest way to fish is to paddle upstream from where you want to start and then drift downstream, adjusting as you go. Anchors and drift socks can help stop or slow drifts in certain areas and keep your boat straight. But for many anglers, it’s only true river fishing if you get your feet wet. For years wading has been the preferred method for people who fly fish, but other anglers are trying it as well. It’s not allowed in DuPage forest preserve lakes or ponds, but you can wade in rivers. DuPage forest preserves offer some great out-of-the-way places to cast in peace, such as this inviting stretch along Salt Creek. Ditch the tackle box. Waist packs or vests with handy pockets let you cast and move through the water with ease. Wading allows stealth presentation and lets you cast into areas you might not be able to hit from the shore or a boat. An easy way to store gear when wading is to ditch the traditional tackle box and use a backpack, waist pack or fishing vest, which gives you hands-free movement and the ability to continue casting as you test different areas. Enter the water slowly and avoid deep water, fast currents and sedimentation. Use a wading stick to check the river bottom ahead of you, or shuffle with your weight on your back foot so you can step back if your footing is unsure. Floodwaters are extremely dangerous, especially if you’re wading or in a boat, so be aware of current conditions and be cautious. Look for fast-moving floating debris and check the weather report. No matter how you fish, always dry and clean your gear when you’re done to avoid carrying invasive plants and animals — some invisible to the naked eye — to other waters. Rivers are the forest preserves’ most underused fishing spots but offer exciting casts and catches year-round. For locations, creel limits, tips and tricks, download a copy of the Forest Preserve District’s fishing guide (link) or register for a ranger-led program. And then get ready to go with the flow!